Further north of Bridlington lies the differing seaside resorts. There is Edwardian Filey only 10 miles to the north with is 4 miles of golden sands and Filey Bigg sheltering the bay. The major town of Scarborough with its all the fun of the fair, ice cream parlours and different attractions along side it beach and harbour-side lies 18 miles up the coast. 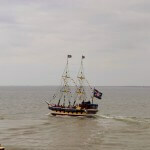 Why not visit Park Rose Pottery, Cruckley Animal Farm, Bridlington Heritage Museum, Sailing from the beach, Burton Agnes Hall or perhaps Bondville Miniature Village. If you are with your family then maybe a visit to the Leisure World, John Bull World of Rock and the Beside The Seaside Museum would be more suitable. After all the sight seeing, why not pop into the 60’s coffee bar for a relaxing break a bite to eat from their themed menu’s and have a coffee. 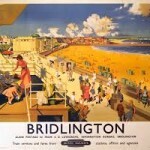 Bridlington has a long history as a resort. If you are visiting there are lots of accommodation options to choose from including guest houses, bed and breakfasts, hotels, apartments, flats, camping, caravan sites and well placed cottages in the surrounding region. 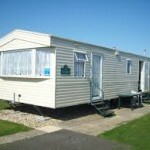 Bridlington has lots of Caravan Parks within the area from the rocky coast to the north and along the long sandy beaches to the south. 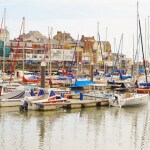 “Brid” as the locals call it, has also become the UK venue for the British Open Darts Competition. The town boasts a superb shopping complex and two excellent full 18 hole golf courses. 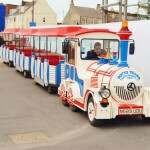 The seafront road-train takes visitors to all the traditional attractions, including funfairs and amusement arcades and for those times when the sun is behind the clouds you could visit the forum complex. The Hull to Scarborough railway divides the town from south west to north east and marks where the Old Town of begins to the north of the line. The Old Town of Bridlington has some retail businesses and the Industrial Estates as well as large residential areas. To the south of the railway line is where the tourist attractions lie, Bridlington Harbour as well as holiday accommodation and some residential areas. As Bridlington grew, it has incorporated the deserted village of Hildersthorpe which is incorporated in the golf course. 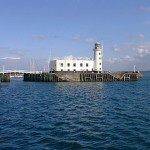 The climate of Bridlington is temperate with warm summers and cool, wet winters. The town being on the east Yorkshire coast of the North Sea, temperatures can vary as much as 5 or 10C from inland such as York due to the wind factor of the sea cooling the summer temperature and warming the winter frosts. The hottest months of the year are from June to September, with temperatures reaching an average high of 19 °C. David Hinde, who lives in the nearby village of Bempton was appointed in the Queen’s Diamond Jubilee Year of 2012 by the Bridlington Town Council as the first Town Crier since 1901. On the 17th of August 2013, at the town’s Sewerby Park, Hinde’s cry was recorded at a massive 114.8 db.